Each focused on a particular word, these essays explore the changing landscape in China from the Cultural Revolution, to the perplexing capitalist/communist hybrid of today. Yu Hua's writing is funny, personal, and touching; this book reads more like a chat with a fascinating friend than a stogy cultural history. The chapter on "Reading" is worth the price of admission alone. 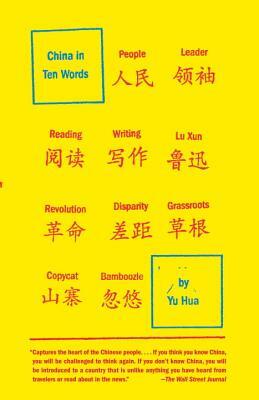 Framed by ten phrases common in the Chinese vernacular, China in Ten Words uses personal stories and astute analysis to reveal as never before the world’s most populous yet oft-misunderstood nation. In "Disparity," for example, Yu Hua illustrates the expanding gaps that separate citizens of the country. In "Copycat," he depicts the escalating trend of piracy and imitation as a creative new form of revolutionary action. And in "Bamboozle," he describes the increasingly brazen practices of trickery, fraud, and chicanery that are, he suggests, becoming a way of life at every level of society. Witty, insightful, and courageous, this is a refreshingly candid vision of the "Chinese miracle" and all of its consequences. Yu Hua is the author of four novels, six collections of stories, and three collections of essays. His work has been translated into more than twenty languages. In 2002, he became the first Chinese writer to win the James Joyce Award. His novel Brothers was short-listed for the Man Asian Literary Prize and awarded France’s Prix Courrier International. To Live was awarded Italy’s Premio Grinzane Cavour, and To Live and Chronicle of a Blood Merchant were ranked among the ten most influential books in China in the 1990’s by Wen Hui Bao, the largest newspaper in Shanghai. Yu Hua lives in Beijing.